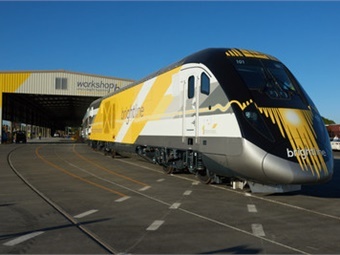 Miami’s Brightline, the only privately-funded express passenger rail system in the country, showcased its first trainset, dubbed BrightBlue. Comprised of two locomotives and four coaches, the trainset is housed at its new railroad operations facility, Workshop b, in West Palm Beach, Fla. The unveiling provided the first opportunity to see the many innovations throughout this first trainset that was manufactured by Siemens in their Sacramento, Calif., facility and is 100% Buy America-compliant, using components from more than 40 suppliers across more than 20 states. 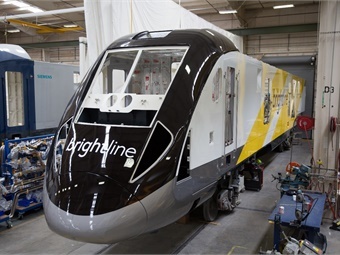 "We are excited to welcome our first Brightline trainset to Florida and provide a preview of the entire train," said Mike Reininger, president of Brightline. "Our trains are among the most innovative in the United States and the world, with every detail having been designed and built from the guest's perspective, making it easy, convenient and comfortable to ride. We are looking forward to the launch our new express, inter-city service this summer. South Florida is very close to experiencing the future of train travel, a new travel alternative as an option to private cars on crowded roads." Innovations abound with Brightline, beginning with boarding. Brightline is the first fully accessible train, exceeding ADA compliance standards and providing effortless access from end-to-end. To do this, Brightline trains feature level boarding and utilize automated retractable platforms that are integrated into the train car door systems. Prior to the doors' opening, the platforms extend up to 12 inches from the train and pivot to create a flush surface for passengers to cross from platform to train, making it easy for those with mobility challenges, pushing strollers or rolling luggage to board. Brightline's interior aisles are 32 inches, wider than any other train, providing ample space for wheelchairs and strollers to easily glide throughout the coach with access to all areas, including the restrooms. Interior vestibule doors also slide open and close automatically, so guests can seamlessly move between coaches. On each trainset, there is one Select and three Smart coaches. With both options, riders can reserve specific seats when booking tickets through Brightline's mobile application, website, or station kiosks. Each product will offer a range of amenities and pricing. Riders will also be able to add additional items, such as parking and ground transportation to their booking to further complete their travel experience, making it connected from door to destination. Single and double seats feature a drop-down multi-task tray that serves a dual purpose. An inner small table can be used alone for a smartphone or glasses and a larger table can be added for items, such as laptops, books, and food. Brightline is offering complimentary, powerful Wi-Fi, powered by multiple antennas on every train, so guests can bring their own devices and have instant connectivity. To power those devices, there are numerous built-in power outlets and USB connections (under the armrests, in the seat pedestals), and in pop-up style table units, so that guests have easy access. Large windows have been designed and aligned with all seats to offer unobstructed scenic views. High ceilings and open luggage shelves create a welcoming and inviting ambiance. Every aisle seat has an ergonomic metal grip handle for guests that are walking through the train or placing bags in the overhead space.